Bats are wonderful creatures. There is a nice variety of them living in our area and we love them fluttering around in the evening hours. Bats play their role in the ecosystem and: their poop is very valuable! It’s called guano. Containing 10 times more nitrogen than compost it’s a useful fertilizer. And all of this is coming together in one project. We are getting the guano from the roofs in our area (mostly produced by the mouse-eared bat) to fertilize those parcels most in need. I actually used most of it already. 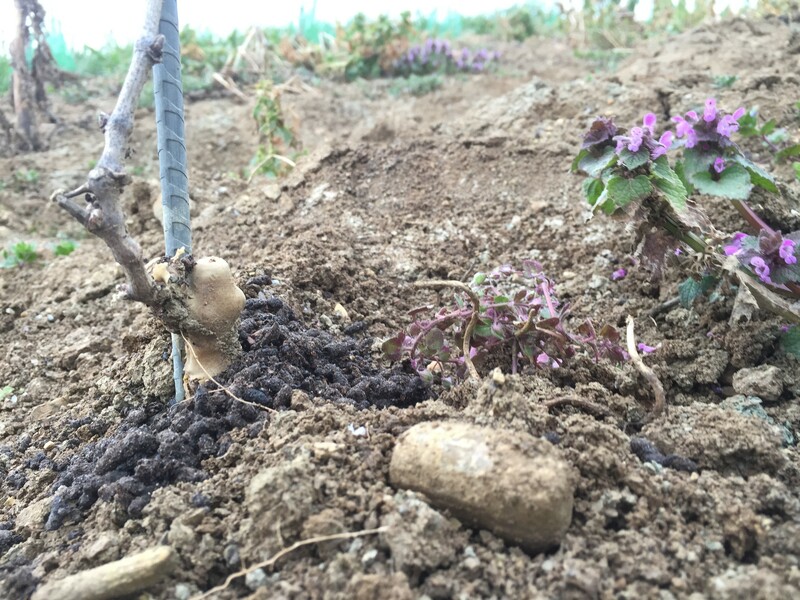 The new Riesling vineyard will benefit from this extra boost! A good hand full for every vine. Together with bat-geek Christian Söder and with the support of the Landesbund für Vogelschutz (one of Germany’s biggest environmental organizations) we made our new Schwarzriesling to be the “bat vineyard”. The project is about driving attention to the rare grey long-eared bat living close to houses so this town-vineyard was a perfect match. We placed a bunch of bat boxes all around the vineyard so those little buddies have a place to rest and the “bat vineyard” gets some visibility. Most of the boxes were screwed on sticks. But one just had to be at the front of our beloved ruin. We couldn’t resist. Christian had built those boxes. Now we’re incredibly curious how frequently they’ll be used! The red wine produced from this vineyard will then become our “bat wine” with a certain amount per bottle being donated for projects specific to the grey long-eared bat. The label will carry the same design you can see on the bat boxes. As always Melanie and Jens did a terrific job, didn’t they? I specifically like this project because it connects so many dots. Locally produced fertilizer used in organic vineyards producing wine to support the fertilizer producers. Nice.